Contact our PartyMojo office at 65696992 / Sales 81606655 / Yolanda 81606622 to enquire now! Drop us a quick email at [email protected] today for your very own fishball live station! Did you smell something fishy…? Yup, it’s us, gill-ty as charged! PartyMojo is bubblin’ and ballin’ up your favourite seafood this season, we couldn’t wait to surface! Introducing PartyMojo’s Live Fishball Station! You’ve waited too long for this, we know. Fishball is undoubtedly everyone’s favourite picnic snack, not only in Singapore, but everywhere else that know fishball! It is round, fried, fun, and it most importantly, it bounces! Couldn’t ask for more! We at PartyMojo are deep-fried in excitement to bring our Live Fishball Station to your very party! Kids love it, and you must have it! Let’s put aside tea-time sweet snacks for a moment. Get greasy and have a ball of a time! Bring PartyMojo’s Live Fishball Station to your party today! Our fishball are served in skewers that prevent your hands from getting oily while enjoying them! What is included in the fishball live station? 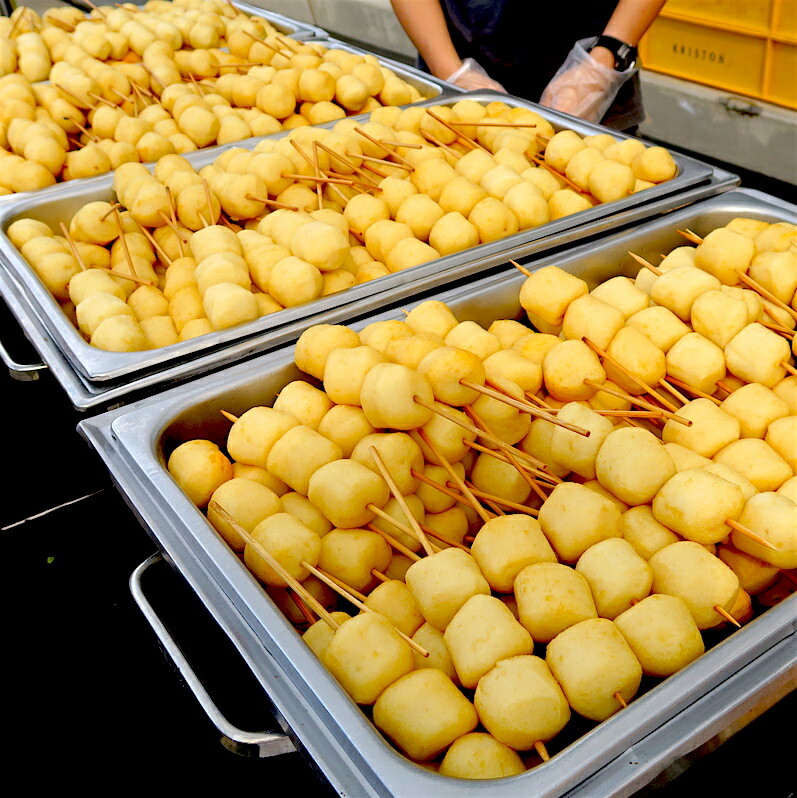 The package is inclusive of 1 manpower, delivery & fish ball skewers live frying station at the event! What’s required from me if I hire PartyMojo’s fishball live station? Simply provide us a table and we’re good to go! Do not worry if you don’t have table as it available for rent at $20. No problem! We can cater to as many people as you want in the hour, after all, the more the merrier! Simply call or email to enquire with your event details and you will get a quotation within a day! Do you serve lesser than 300 servings? Unfortunately no, our minimum is at 300 servings. Your guests can always come back for more fishballs! Fishball station at your event! What did one fishball say to the other? Skew’s me, coming through! Hot, fresh and tender fishballs coming your way~ boing boing! And well, you guessed it! The fried fishballs come in threes on a skewer, per serving. Easy peasy hardly messy! The skewers keep your hands grease-free while you enjoy every bite of those tender bouncy fishballs! PartyMojo’s Live Fishball Station conveniently comes in 2 options, namely the pushcart station for party snacking, and a catering station. The pushcart station is recommended for personal or private parties such as birthday parties, baby showers, and such. Now the catering station would be perfect for higher accommodative events, accompanying a spread of buffet. Drooling already? What are you waiting for!? Why fishball at private event / family day? PartyMojo’s Live Fishball Station will steal the limelight over all the other party snacks and here’s why: These little appetizers are the perfect grab-and-go munchies, have it seated, standing up, and even when the little ones are busy playing games! And what’s a fun food without a mess? Yup, fishballs! We hear you, moms! No messy cream, no grains and crumbs snowing all over your floor, just perfect little fillers before the big meal! Fishballs always gave us the impression of an Asian delicacy that are usually served with soup or noodles. Many of us would probably not expect it to be an authentic Nordic cuisine as well. Fishballs are called Fiskbullar in Sweden and Fiskeboller in Norway, usually packed in cans. What’s more? They are commonly served with potatoes, pasta, boiled green peas or even caviar. Never expected fishballs to have a western twist, did you? Well, now you can have them served the way you fancy! Enquire with PartyMojo today at 6569 6992 or 6569 6998 about catering our fishball live station for your next event!